British explorer Mark Evans’ historic mission to cross Oman’s Rub Al Khali desert has reached the border with Saudi Arabia. In his most recent progress update, the general manager of Outward Bound Oman reported arriving at the oasis settlement of Al Hashman – 770km from the finishing line in Doha. 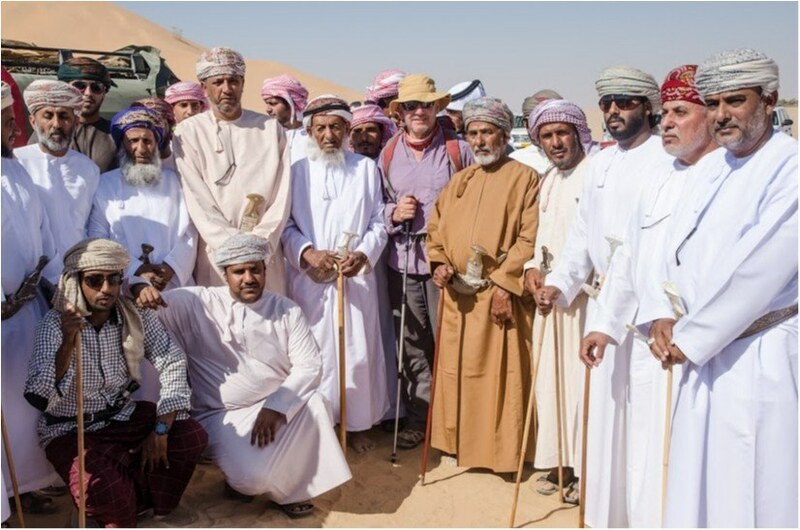 Evans and his Omani companions, Mohammed Al-Zadjali and Amour bin Ali bin Majeed Al Wahaibi, are aiming to re-trace the steps taken by Briton Bertram Thomas in 1930 – the first Westerner to cross the vast Empty Quarter desert. They are even planning to tuck into the same treat as Bertram Thomas on Christmas Day – baked beans! Mark Evans’ most recent diary entry read: “Our final day travelling to the west was yet another memorable one. The dunes to our north are now large sand mountains that require a mountaineers’ eye to summit via the easiest route. A nine km trek saw us in sight of the small community of Al Hashman, the last before we enter the sands, and the border with Saudi Arabia. “We were met on the plain by the green oasis by the vice wali of the community, and directed to a large Bedouin tent that held another 100 or so people who greeted us with poetry, singing and dancing, coffee and delicious halwa. He added: “Amongst the crowd a young man was keen for us to meet his grandfather, Sheikh Hussein bin Ali bin Rumaida Al Rashdi. Sheikh Hussein had no idea how old he was, as birth certificates did not exist when he was born, but he thinks he is more than 100 years old.